604 Great South Road Penrose. (until 2006 called TDL / Telecom Directories Limited). (2014 renamed to Spark New Zealand). divided in 1987 into NZ Post, Telekom and Post Office Bank. and New Zealand's largest Telecom Operator. 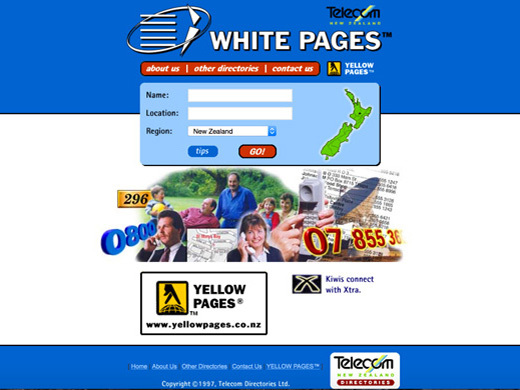 1996 October 22 registration of the Whitepages.co.nz domain. to launch their White Pages on the internet. and while Gustave Eiffel was working on his Eiffel Tower (1887-1889). used in over 120 countries all around the World.